Digital workers are mobile, agile, collaborative, and engaged. 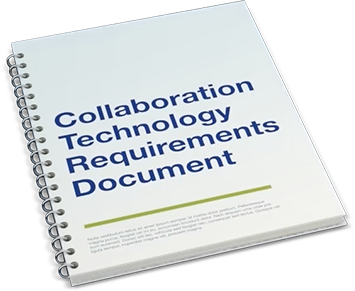 IT and facilities teams similarly are looking for standardization and support. Do you have the right services, technology and business plan to meet these demands? We can develop a technology roadmap for the long-term viability of solutions. We’ll do this according to your timetable, and without disrupting current business. Too often organizations assume that one type of collaborative conferencing will meet all their needs. In reality, different forms of collaborative conferencing meet different needs. It would be wasteful to install a video conferencing system if an assessment indicated that all people needed is good quality audio with graphics support. Similarly, installation of a graphics system may not meet the needs of all the intended users — especially those needing to see facial expressions of others. Any needs assessment should look at all forms of collaborative conferencing — audio, data/web, and video – real-time and delayed. Both the Needs Assessment and Benchmark comparison service will be performed remotely either via video conferencing, telephone or online surveys. For a limited time, receive your Collaboration Business Plan at a 65% discount! Have questions? We have the answers. Complete the form to get started today. In order to design and implement a successful collaborative conferencing system (audio, web, video, telepresence, and unified communications), it is important to undertake a thorough analysis of an organization’s needs. Input must be obtained from actual users. Provides data needed to develop economic justification for determining system cost and dollar benefits. Gathers input for the system design phase by identifying functions, locations, and specific equipment needed. Helps to assure that once a system is installed it will be used effectively for the right applications. Contributes input into long-range plans for system expansion. The purpose of a benchmark study is to determine how conferencing and collaborative communications technologies meet the needs of the client and how the client’s adoption and usage of the technologies compare to other organizations who have successfully adopted video conferencing and collaborative communications tools. AVI-SPL maintains a database of 70 end-user organizations and what they do related to conferencing and collaboration for this purpose. We are an advocate of workplace transformation – the kind of transformation that is seeing office layouts evolve from isolated cubicles to open spaces, huddle rooms, and similar areas that inspire collaboration among coworkers, and that turn meetings into sessions where real work gets done. We’ve designed and deployed more meeting spaces than any other integrator. That kind of experience, and our commitment to being the standard-bearer in collaboration, led us to develop our own Virtual Meeting Room service. Our focus on collaboration can also be seen in our innovations in meeting-space control and in our partnership with Microsoft, which had given us elite partner status to offer to its Surface Hub. In each case, from services to innovations to partnership, we have put our commitment to workplace transformation and huddle spaces in practice. For a limited time, we are offering a 65% price discount! Complete the form to schedule your assessment.